It’s almost Summer, and my teenage boys will be out of high school in a matter of days. Which means I need to get serious about finding a board game to play with my son Drew. Recently Drew and I have been playing Grail Quest, a 1980 solitaire RPG from Metagaming. But sooner or later, we’re going to find that grail, damnit, and there’s not much point to replaying those old Fantasy Trip programmed adventures once you’ve solved them. We’ve also playing the occasional round of RoboRally and of course Barbarian Prince, but to round out his education I need to include an assortment of fantasy board games, and I prefer something we can play in 90 minutes or so. 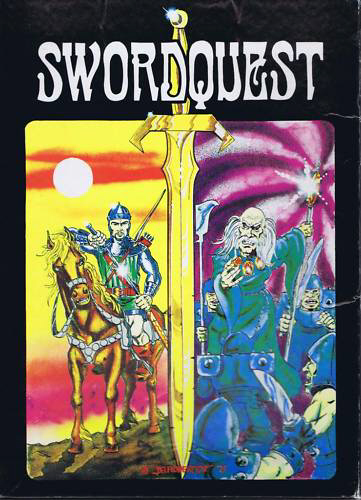 This week, I’m considering Swordquest because I found a dusty copy in the basement that hadn’t been filed away yet. Swordquest was designed by R. Vance Buck and originally published in 1979 as Task Force Game #7, part of Task Force Games Pocket Games line. Humble in origin and slim in production values (the original price was $3.95), these little zip-locked games proved extremely popular, and many are still fondly remembered three decades later. Altogether, they published a total of 21 Pocket Games, including some of the most popular titles of the 70s and 80s, such Star Fleet Battles, which launched an entire line of game merchandise, and Starfire, which went through five editions and was the inspiration for the line of SF novels primarily written by Steve White and David Weber. The most popular Pocket Games were re-published in a second edition in more sturdy boxes in the early 80s, including Swordquest. 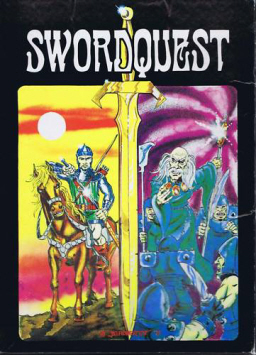 The inspiration for Swordquest — as with most fantasy boardgames of the era — was clearly J.R.R. Tolkien. The races of the kingdom of Tirrane consist of elves, dwarves, and giants, and there’s also a powerful dragon and winged creatures named wrogs rather obviously inspired by Balrogs. Like most Task Force Games, Swordquest comes with a gorgeous color map, which even in 1979 was almost worth the price of the game. 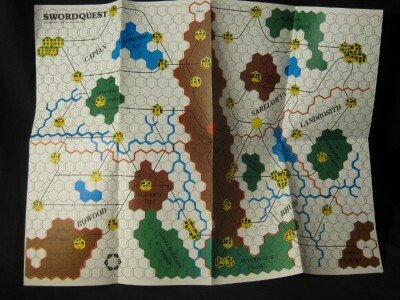 More than once I was tempted to put their maps to use in various D&D scenarios I was cooking up at the time — especially the Swordquest map, and the map for Valkenburg Castle, Task Force Games #1. Two coalitions – one good, led by bearded wizard Adam the White and one evil, led by Shaymar, the chief sorcerer of the evil entity Sogmoth – scouring the countryside of Tirrane searching for the lost Sword of Lumina. The good guys want to destroy the weapon in the fires of Sogmoth’s Citadel, Dray-neg, to remove all threat to their master’s life. The rules also allow for the interjection of a third player, the Druids, who seek the sword so that they may hold the balance of power. Each side’s forces center around five paladins… The quest of the paladins is to search out the lost sword and get it to their respective citadels…. The game is won by the first side to get the Lost Sword of Lumina to its citadel. This entails searching through the cities for sword counters and then fighting your way across the board… to get to your fortress. Two of three swords are counterfeit; a die roll is made to determine whether a given sword is genuine. You can read Tom’s complete review at the Analog Games site at RetroReview.org here, and you can get all the vital stats on the game (including lots of pics) at the marvelous Board Game Geek. So yes, maybe I’m just trying to share my childhood hobbies with my teenage sons. I’ve kept these games in mint condition for over 30 years, I should get some real use out of them now. One nice thing about these old Pocket games — at least the rule books are slim (16 pages for Swordquest), and they don’t require a lot of set-up time. Yes, perhaps a bit more set-up than an Xbox game. But it’s worth it. Or so I keep telling Drew, just before unleashing my balrog on him. My wife and I have had a lot of fun with Lords of Waterdeep. There are a lot of options and strategies, and the game immerses you in the intrigue of the environment if you invest in it. One problem…I have yet to beat her. Gus — sounds like fun!